The 8 Best Fly Fishing Spots in West Virginia! The Appalachian Mountains have some of the wildest, beautiful and unexplored parts of the Eastern United States and provide some of the best places in the country for fly fishing enthusiasts. The pristine mountain streams flow down forming tributaries to West Virginia’s rivers and are home to many species of trout including, brown, rainbow, and golden rainbow, as well as other fish. 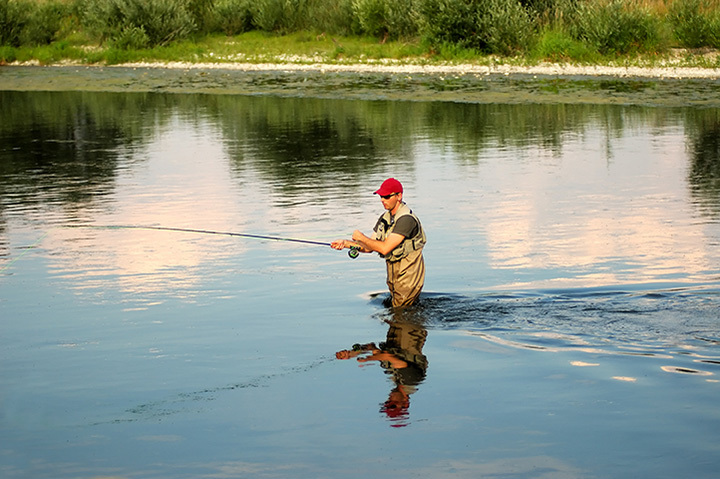 The locations listed below for the best places to go fly fishing will help you decide which destination is right for you. When it comes to fishing, West Virginia truly is almost heaven. Once not capable of producing fish because of high acid levels, the Cranberry River near Richwood, West Virginia, now is one of the most popular fly fishing destinations in the state. Part of the Cranberry Wilderness and the Monongahela National Forest, and known for great trout fishing, it’s been named one of “America’s 100 Best Trout Streams.” A tributary of the Gauley River in southeastern West Virginia, and with its start in the Cranberry Glades area of the state, the river follows the natural contour of the landscape through the nearly 36,000-acre wilderness that is the largest in the state. If you enjoy the serenity and enjoyment from fly fishing, you’ll enjoy fishing for brook, brown, and rainbow trout along this beautiful and scenic river. Always be aware of your surroundings, though, since this area is a black bear sanctuary. Affectionately known by local fishermen as “the Lady,” the crystal clear emerald water that runs down from the Cheat and Gauley Mountains of West Virginia form the Elk River. Over 10,000 fish including brown, brook, rainbow, and golden rainbow Trout are caught each year. This tributary to the Kanawha River is approximately 172 miles long and has everything a fisherman could want—slow, lazy pools and mountain rivulets form the perfect place to meet your next trout. The highest part of the river offers a great fly fishing destination for the serious fisherman because of the limestone creek bed. Stocked with brook, brown, rainbow, and golden rainbow trout once in February, then every two weeks from March through May each year, Dry Fork is the 40-mile tributary of the Black Fork of Cheat River in eastern West Virginia near the Monongahela National Forest. Literally winding through above ground and underground caves, portions of this creek dry up during the summer months, giving it the name Dry Fork or Dry Run. Don’t let the name fool you because this is one of the best places for fly fishing in the state. The Seneca Rocks area of West Virginia is known for its raw and unspoiled beauty, and nowhere else can it be so clearly seen as along Seneca Creek. Joining the North Fork near Seneca Rocks Discovery Center, Seneca Creek, listed as one of the “Top 100 Trout Streams” by Trout Unlimited, lies within the Monongahela National Forest. There are restrooms and rangers at nearby Dolly Sods Wilderness who can point you to the best fishing locations along the small streams. Buffalo Creek was part of the massive improvement project that began in the late 1970s by the U.S. Army Corp of Engineers and Appalachian Stream Restorations to slow the flow of the water, allowing for pools of water and deflected currents. This, in turn, lured more insects, crayfish, and other trout attractors to the area. The creek is stocked once in February, then bi-weekly between March and May. There are several hot spots for fly fishing along this state-supported and stocked fishing spot known as Milligan Creek, located in Greenbrier County just a few miles from Lewisburg, West Virginia. Rainbow trout and largemouth or spotted bass are plentiful since stocking is done on a regular basis. There is a one-mile section of the creek that is designated for fly fishing only, and Milligan Creek is the state’s only natural home for the native Brook trout. This freestone trout stream is near Lewisburg, West Virginia and is one of a limited number of catch-and-release locations for fly fishing. Easy to wade, there are several places with deep pools and walking is a must for most of the area because of private landowners. Fishing is good year-round, but water levels are usually lowest in the summer months. This Greenbrier River tributary has a gravel bottom and a section that is for fly fishing only on private property. There is a good number of aquatic insects like mayflies, caddisflies, and midges, making this a very popular site for locals and those who travel in to the area. Thorn Creek is a favorite location for fly fishing, and like many of the creeks and rivers in West Virginia, has a section dedicated to catch-and-release. Part of the Thorn Creek Wildlife Management Area and a tributary of the South Branch of the Potomac, this 25-mile waterway is scheduled for stocking, and rules apply to these areas, such as fishing is only permitted during the daytime, no live lures can be used, and no trout can be kept, but returned to the water immediately. View more West Virginia Fishing Holes.